Not just dead last, but dead last in all three categories. I was sorry to see my History colleagues down at the bottom of the middle third, but at least we come in third on the Verbal score. 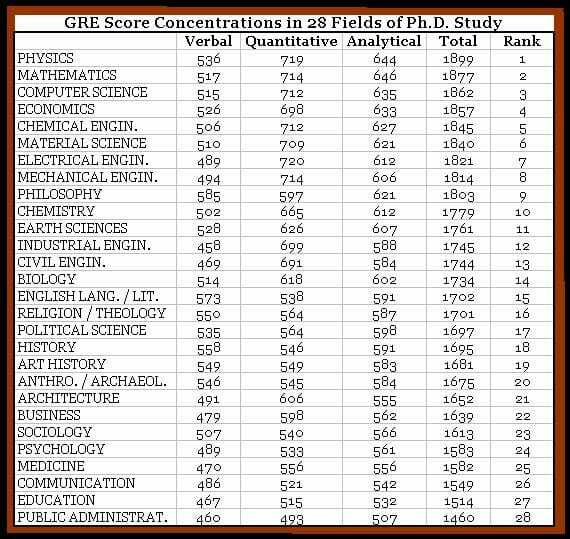 And they're not only last in total GRE - they're last in every one of the three subscales. And educators are second to last in all three subscales. There is a Texas test around somewhere on the web showing that education majors actually decreased their SAT scores after 4 years of college. The only major to achive that distinction. 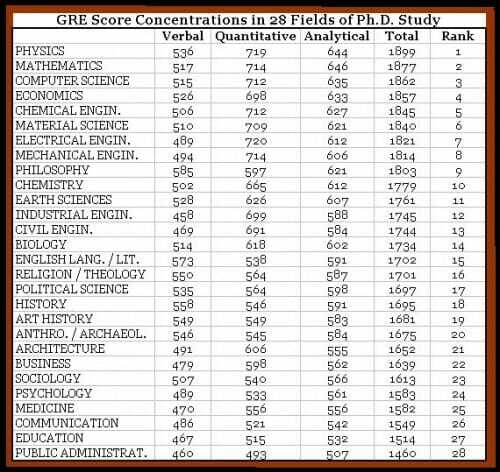 What's interesting is that those on the bottom of the list consistently act as if the ones up top are maladjusted socially awkward folks who can't put two sentences together, and yet my electrical engineering brethren collectively score above all three of the bottom fields on the verbal. Only that while they may claim specialization-- that they are social creatures more suited to the fields they're entering-- they're actually poorly suited to do anything requiring cognitive thought. Luckily for them, "public administration" requires little! You get the quality of education you seek. Not only is EE #7 overall, it's #1 in the quantitative scores. And because there's so many foreign nationals pulling down the verbal scores, those US-born EE PhDs *cough cough* must really be hot stuff. Heh. Yes, indeed. We obviously have many of the same predispositions. I bet if you add a column with the % of Ph.D.s granted in each discipline, it would be in reverse order. With the most granted at the bottom of the list. This table gives additional insight as to why the dean of the business school at the University of Arizona is trying to eliminate the Public Administration degree program as part of the university realignment to deal with budget cuts. If he's successful in this endeavor, I might just have to send him a check. Following the links, this seems to be the averages for the applicant pools, not those admitted. I was wondering about Medicine too; perhaps its the students who take both the GRE and the MCAT based on being unsure of their prospects for Med School? My main reaction is: all of the verbal scores are craptacular. Anyone notice that the English Lit Majors can't crack 600 in the Verbal? This is horrifying - the people we are counting to improve the language skills of the engineers have worse language skills than those engineers. Maybe THIS is why it is so difficult to hire engineers who can write good reports and give good presentations. Their real skills are being destroyed by the "educators". >>>My main reaction is: all of the verbal scores are craptacular. Those of us with really good verbal skills went to law school, to everybody else's everlasting consternation. "I bet if you add a column with the % of Ph.D.s granted in each discipline, it would be in reverse order. With the most granted at the bottom of the list." Perhaps two such columns would be more interesting: one showing % of PhD's for U.S. citizens in U.S. universities; and one showing % of PhD's for foreigners in U.S. universities. I doubt that many foreigners leave their homeland to pursue degrees in education, sociology, and communication. I'm a philosophy PhD right now. I'm amazed how well Philosophy scored. I can't believe philosophy got top in verbal, even better than English. Amazing. Also, we're sixth in analytic. You'd hope we'd be able to do that well. But, man, we're pulled down by that 16th place in Quantitative. We can analyze, communicate, we just can't add. What do we need that for anyways? I took the GRE twice, seventeen years apart. The second time was computer graded on the spot, with the questions being given dependent on how you answered the previous ones, IIRC- unlike the first itme, where I was handed the all the questions on paper. Because the grad school I applied to didn't care about the Ananlytical section, I wasn't particularly worried about it. However, the first time, I made a halfway decent effort on the Analytical section. The second time,I blew off the Analytical section, just putting down anything or a quick reaction instead of pondering the question. Yet my Analytical scores were about the same both times. The scores don't matter that much in the long run. I doubt that someone who scored 500 on the Quantitative would do well in grad school in science or engineering, and math of course. But beyond that, one's work ethic will be the bigger determinant of academic success than one's GRE scores. My GRE scores were better than my grades- lazy perhaps.Definitely a procrastinator. I saw that table before a couple of years ago...it's a VERY old table, notice that it still has the "Analytic" section. The GRE replaced the Analytic section with an Analytical Writing Assessment section about 6 years ago (more I think). This essay section is scored from 0-6 unlike the math and verbal. I was expecting social work majors to be last.